Eric Glass is a senior portfolio manager at the Arizona State Retirement System (ASRS), where he oversees the private market portfolio. In this interview, he shares the reasons behind ASRS' success in the last decade, why they are less bureaucratic than their pension peers, and how the investment office is using cutting edge tools to analyze investment opportunities. 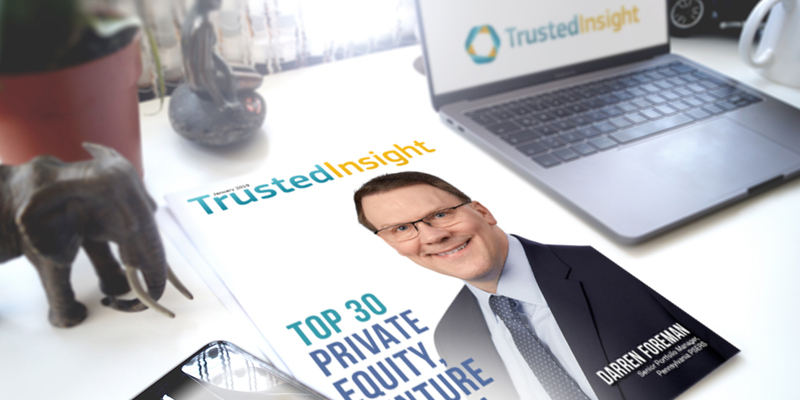 Eric Glass was recently named on 2019 Top 30 Private Equity, Venture Capital Investors. This interview has been condensed. Trusted Insight: Can you tell us about the ASRS investment office and your role there? Eric Glass: ASRS is a $40 billion dollar pension fund that manages the assets for the state retirement system of Arizona. My role specifically in our 10-person team is to oversee public and private equities as well as real estate. We manage all of our equities against a global benchmark. On an annual basis, we develop an implementation plan that outlines the strategies or levers that we intend to use to beat this benchmark. In private equity, I lead the due diligence effort to identify top-performing on funds and co-investments. In public equity, I oversee two PMs that handle the daily execution of our internally managed portfolios that are trying to modestly beat the index. We're also implementing some factor-based strategies and developing an alpha-overlay program in addition to taking some index construction bets against the global benchmark. "The real estate program was set up by our brilliant and visionary CIO who has 30 years of real estate experience." In real estate, we've moved away from funds and implement our direct ownership program in separate accounts with a dozen or so partnerships. That basically allows us to own great assets for long periods of time with specialized operators. The real estate program was set up by our brilliant and visionary CIO who has 30 years of real estate experience. I have one person under me that helps run that program. That's kind of a flavor of how I split my time among each of those three asset classes. Trusted Insight: ASRS beat its 3-, 5- and 10-year return benchmark. What’s your approach to keeping that momentum alive given the low-return environment? Eric Glass: I believe that our success has largely been driven by what we've done in private markets. As a fund, we were pretty early in identifying really great partners in private debt and real estate for our separate accounts, which gives us greater control and better terms. It also gives us access to great deals because of superior long term alignment. "We built our systems internally using an open-source platform coding language called R… It's now the backbone that we use to report our investments to the board and to do some pretty interesting slice-and-dice type analysis for our investments." In equities, it's been a little harder for us to beat the benchmark but we've really turned the tide in terms of outperforming in that space with the private equity partners that we've honed in on over the last five years and some of the strategies I mentioned in public equities. Trusted Insight: What are some of ASRS investment office's competitive advantages? Eric Glass: We have a big emphasis on being as commercial and efficient as possible but there are probably three things in particular that I would highlight. First, we have a pretty lean team, which orients us to focus on the highest and best use of our time so we perhaps punch above our weight. Second, we're less bureaucratic than some, which allows us to move from the idea phase to implementation more quickly while also having the benefit of independent thinking. Third, we have a big emphasis on being cutting edge in reporting and analytics which we've actually built in-house. It's been a big emphasis in the last few years, led by our CIO. "If you look across institutional investors, we share a lot of commonalities across several dimensions and could do a better job comparing business practices." The systems we've developed have not only improved our communication with the board, but also have improved our decision-making process quite a bit. We built our systems internally using an open-source platform coding language called "R." We have really developed some pretty keen coding skills that's allowed us to build this platform that we now use across all of our investments. We built it about five years ago for private markets, and then over the last two years, we've been building it in the public markets. It's now the backbone that we use to report our investments to the board and to do some pretty interesting slice-and-dice type analysis for our investments. Trusted Insight: Is ASRS pouring more into the private equity asset class like it's institutional peers? Eric Glass: Our private equity program is close to 12 years old. Now that private equity and public equity are managed against a global benchmark, we don't have a specific target allocation for PE. We do have a liquidity governor that says we can't do more than 20% of our total equities in private equity, which translates to about 10% of the total fund. That is modestly higher than our former target of 8%, but it's not a particular mandate for us to go up to that maximum of 10%. That being said, we do think that there are definite benefits to owning private equity with great partners. The delta between private equity and public markets is perhaps not what it was 10-20 years ago. I think that gap has narrowed a little bit. Trusted Insight: Pension investors say that it’s a challenge for them to get into top VC funds. How does ASRS tackle this issue? Eric Glass: We would actually tend to agree with that, for a fund of our size anyway. Venture capital was part of our early strategy in private equity but we had mixed results. We actually stopped investing there in the past few years. We just found that you really need to be with the short list of very high-caliber VC firms to build a real program and at our check size it’s not particularly feasible. Trusted Insight: What can institutional investors do to be more collaborative with each other? Eric Glass: I believe that having direct, open communication among each other goes a long way. If you look across institutional investors, we share a lot of commonalities across several dimensions and could do a better job comparing business practices. I don't necessarily have a specific blueprint or initiative to champion but I do think you've hit on something that's true, that there could be a more collective effort for everyone to row in the same direction. View our full catalog of interviews here. The full list of 2019 Top 30 PE, VC Investors can be found here.